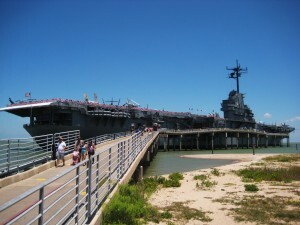 The USS Lexington Corpus Christi Museum is a Sandpiper W.A.Y. Program Co-Partner and offers Sandpiper Guests a discount on admissions pricing. Stop by our Front Desk to pick up your coupon for $1.00 off admission to the USS Lexington Museum. Find out what life was like on a WW II aircraft carrier when you step aboard the USS LEXINGTON. Despite repeated attacks during WWII, LEX never sank, prompting Japanese propagandist Tokyo Rose to dub her “The Blue Ghost”. LEX, illuminated at night with ghostly blue lighting, is a National Historic Landmark located on Corpus Christi Beach. New to the Flight Deck are two 5”/38 gun mounts weighing in excess of 100,000 lbs each and able to launch a 55lb projectile nine miles. And, don’t miss the exciting F/A-18 Hornet, the plane currently being flown by the Blue Angels, in all her glory. A visit to this” city at sea” is like a journey through time. Step onto a real movie set where the movie Pearl Harbor was filmed. See vintage aircraft being restored. Sit in the cockpit of a real jet fighter. See where planes took off and landed in the middle of the ocean. And of course the three-story tall MEGA Theater and Flight Simulator. Our newest adventure is sure to send shivers down your spine. Our Virtual Battle Stations are truly an interactive experience that thrusts you into the chaos and grit that was World War II. It’s time for you to experience this one-of-a-kind adventure. The USS LEXINGTON Corpus Christi museum is open year ’round seven days a week for touring, youth overnight camps, meetings and events.. *We are closed on Christmas and Thanksgiving Day.